It wasn’t until I was perusing some videos online, which mentioned the death of Hugo Chavez, that I was made aware of his weekly program, Aló Presidente. While no comments on the content of the show, the idea is certainly one that needs to be embraced. The problem is one that we have nowadays worldwide. Political leaders are treated like kings. While that might seem amusingly obvious, the underlying point is that political leaders often consider themselves so much better htan ‘the people’ that they’re in a constant bubble, afraid to interact regularly with the outside world. We end up with a political class that can’t think on its feet, and is ignorant to the realities facing those they represent and/or govern. What we have, is processed politics. Every action, deed, policy is researched, strategized, planned, scripted and rehearsed, before it ever sees the light of day. We end up then with governance that isn’t based on reality, but on what was perceived to be the best response in a managed outlook. Sure, this makes for great PR script, and the news loves it, but what we don’t have are politicians knowing issues. For all the outcry about Obama reading from autocues, the same was true for Bush as well. They can’t speak without the autocue, because it’s not ‘their’ words they’re speaking, it’s those of their staff, of the manderins infesting the halls of office. This is where Aló Presidente came in. It was a mostly unscripted show, where policy was sometimes made in public, and responses were made by Chavez on the spot, based on his own knowledge, experiences and judgement. Can you imagine any western politician doing that? Obama or Bush, Merkel or Hollande? The nearest analogue is the British Prime Minister’s Questions (PMQ), which happens Wednesday lunchtimes, and where MP’s get to ask questions of the PM. While this has been dominated in recent times by the party leaders, and an increasing boorishness, it’s still an important aspect where a politician is put ‘on the spot’ and required to give some kind of answer without consultation. There are also Question Times in various other countries, but they don’t have the spotlight of the PMQ. In short, it’s a test of competence and confidence in the role. Instead we now have a professional class of politician that is largely immune from being asked difficult questions, and the higher the office, the more insular they are. It’s to the point that even at times when questions are (supposedly unscripted) and politicians have to ‘go it alone’ (such as the US Presidential debates) politicians are inclined to not answer the question they were asked, but instead to recite the talking points closest to the question. This led to a memorable Vice Presidential Debate in October 2012 when Vice Presidential candidate Paul Ryan was asked for specifics on a tax plan. After spending 60 seconds repeating talking point, he was cut cold by a comment ‘no specifics then’ from the moderator. It’s the aura of invincibility and power that leads to this. Senior politicians are left insolated from the mood of the electorate, protected behind a cordon of power. Most of all though, they feel afraid to act independently and with rapidity for fear of consequences and loss of their positions. Politics has stopped being about doing what’s best for the country, and is instead an easy job as a mouthpiece for ideologies. It is no longer about the cut and thrust of debate, but the slow ponderous strategic moves of chess. However, the same cannot be said of the living Democrat ex-Presidents. Bill Clinton is well known and makes many appearances and undertakes significant political and humanitarian missions, although he’s probably not the most approachable. Jimmy Carter, on the other hand, builds houses for the poor, despite being 88. It’s an exercise in humility in many ways, demonstrated incredibly clearly last year during the UK’s ‘pasty crises. Then you had senior UK politicians rushing to bakeries, to buy savoury baked goods, and looking very uncomfortable as they attempt to do so. It’s also one thing that’s made London Mayor Boris Johnson a well-regarded figure in British politics. He clearly doesn’t speak from a well-rehearsed script, and admits to inhabiting the same world as most people (even to the point of chasing off a gang of attackers on his bicycle, even if he shouted “oiks” at them), and yet despite his gaffs, blunders and accidents, he is on an upward trajectory, politically. Yet the fact remains that, as a whole, politicians are increasingly isolated from their constituents, appearing ever more in staged, and managed events, with topics pre-cleared and no requirement to actually answer the questions they’re given, or any pushback on falsehoods. 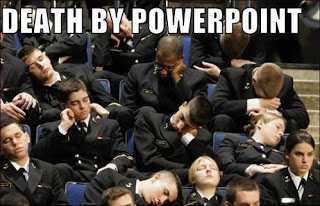 It’s a lot like the powerpoint presentation you get from some mis-level corporate drone. They can only answer the questions by referring to the pre-planned presentation, can’t do anything or say anything without approval from others, and they’re going to say what they came to say no matter what. We now have governance by Powerpoint.